Today the pinnacle of West African economic achievement, Ghana in 1963 was a very different beast. Beset on all sides by problems caused by sitting president and dictator Kwame Nkrumah, the once-mighty West African state seemed almost about to collapse. It may have almost destroyed itself or gone into a military dictatorship like many other states before and after, had it not been for a very timely state visit by Nkrumah to Cairo, to visit his friend Nasser for support in forming a pan-African organization. Though eventually turned down, it was this visit that allowed Ghana's remaining opposition ministers and military to return the able and wise financial minister Komla Gbedemah from self-imposed exile, which he had fled to ahead of one of Nkrumah's purges. Returning to Accra in triumph, Gbedemah was quickly set up as the head of a transitional government of Ghana in hopes of righting the economic woes of the country before a new Constitution could be drafted. Nkrumah, humiliated, was forced to stay in Cairo in exile until eventually returning in the 1980's. Gbedemah quickly set about ending Nkrumah's grandiose financial schemes and instituting more sound fiscal policies, including a de-nationalization campaign for many industries throughout the country. Perhaps the most important thing Gbedemah did, however, was refuse to step up as a military dictator in Ghana. Tossing away the so-called "Nkrumahism", Gbedemah considered himself too old to be dictator, and so instead presided over the drawing-up of a new national Constitution that better provided protections against future dictators. The document which was drawn up would prove just as revolutionary as the later achievements of Ghana, as it set the framework for many African states. Setting up a federal parliamentary government, the Constitution also included rights and protections, as well as recognition, for all of Ghana's tribal groups, essentially turning a country that had thus far attempted to remain a unitary state into a multi-ethnic, multi-cultural federation of peoples headed by a looser, weaker government. Though frowned upon by Nasserists in North African and the self-proclaimed "Africanists" in southern Africa, Ghana's new Constitution quickly became a framework for surrounding nations, including Upper Volta, Togo, Benin, Nigeria, Guinea, and Mali. In addition to this contribution, Ghana also made another massive one: the founding of the African Economic Community. 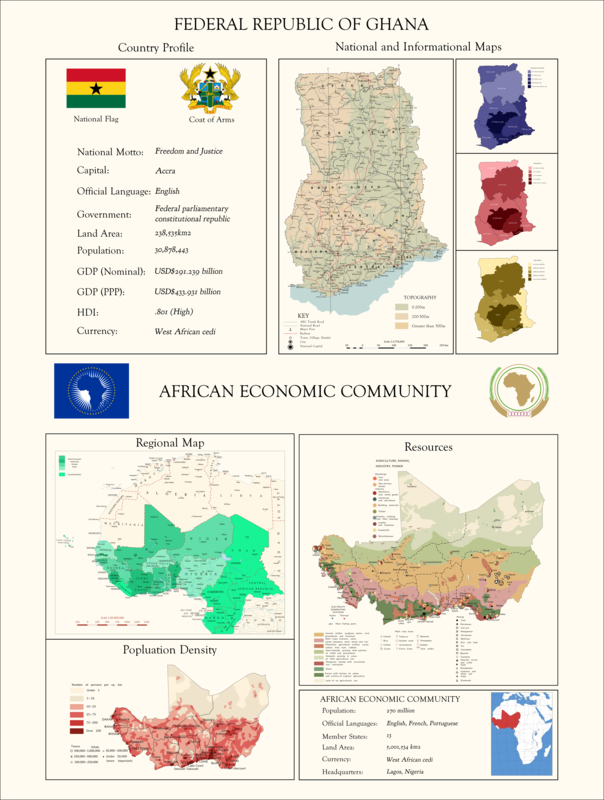 Founded in 1972, the organization's stated goal was is, unlike the Ethiopia-based Organization of African States, to unite Africa under a single economic bloc and community to combat foreign influence and make Africa the powerhouse of the future. Toward these ends, the West African (and so far only) members adopted the West African cedi, with the intention to adopt a newer currency once more members joined. Unfortunately, as the Cold War drags on by the 25th year of the AEC, 1997, Africa is still best by too many rivalries to fully ally together. Besides the West Africans and their allies, there are the Nasserists in North Africa behind Nasser's successor in Cairo and the Africanists in southern and eastern Africa under a coalition white-coloured-black government in South Africa. These three groups vie over the future of Africa, as all three have enough power, population, and capital to one day make the continent theirs. On the bright side, the African Economic Community has proved to be the greatest achievement in West Africa's history since colonialism finally lost its grip. Development of the nations therein, particularly industrial and manufacturing development, has rapidly increased, and the living standards are the highest on the continent outside of white African communities. Ghana and Nigeria lead the way, with living standards on par with many Europeans and economies that have become large enough to compete on the world stage without outside help from either Britain or France. It is a time period of prosperity and growth, with many West Africans looking forward to the future. There are, of course, always struggles on the way, just as all nations have. Corruption, underdevelopment, disparity in wealth, and political instability all plague some or all of West Africa at one point or another, but the nations, particularly Ghana, are still growing. With each passing year, they grow stronger and more able to combat the problems they face and put those problems behind them in order to face the bright future all West Africans make for their future.